WASHINGTON DC January 7, 2015– For the first time in 14 years, Michigan has a new senator in Washington. And for the first time in 35 years, Carl Levin isn’t representing Michigan in the Senate. Levin, a long-time friend of labor, retired after serving Michigan in elected office for 45 years– first as a Detroit city councilman, then as a U.S. Senator. 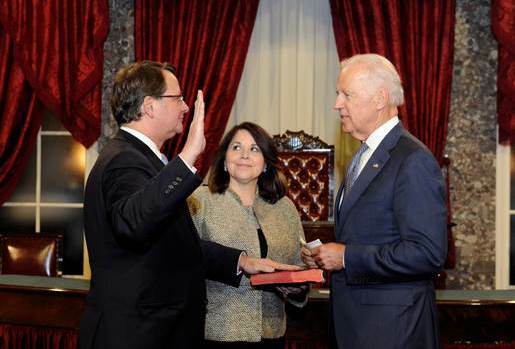 On Tuesday, Gary Peters, a Democrat from Oakland County, was sworn as Michigan’s junior senator– the only Democrat among 13 freshman senators to take office in the chamber now controlled by Republicans. “I am truly honored that the people of Michigan have entrusted me to represent them in the U.S. Senate,” said Peters in a release to the Associated Press. Despite the tireless work of dozens of Kent-Ionia Labor Council volunteers, there was very little reason to celebrate on Election Day 2014 for working men and women in Michigan. Gary Peters’ victory over Republican Terri Lynn Land was maybe the only bright spot. In statewide races with very low turnout, anti-labor conservatives handily beat pro-labor candidates– notably Democrat Mark Schauer who lost to incumbent Rick Snyder in the race for governor. Rosita Tipton, a KICLC trustee and member of AFGE Local 3272, was one of the many union volunteers in Grand Rapids getting out the vote for labor-friendly candidates last October. “I saw a lot of people working hard to get candidates like Mark Schauer and Gary Peters elected,” Tipton said. “Election Day results were a bit frustrating obviously, but seeing Sen. Peters win was definitely a huge victory for the middle class. This entry was posted on January 7, 2015 by WMALC in Political news and tagged AFGE, Democrats, elections, Gary Peters, Lansing, Michigan, Republicans, Rick Snyder.